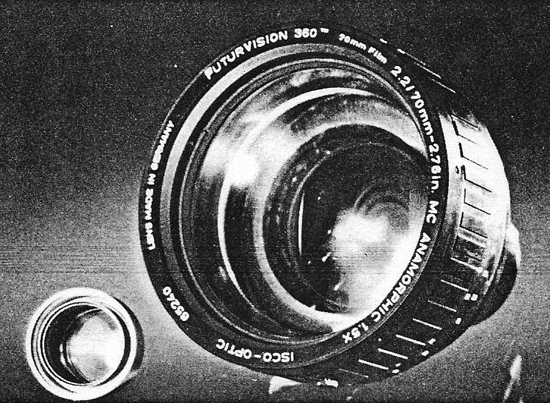 A conventional projector lens compared to the exclusive FuturVision lens. WHEN LOEWS THEATRES opened its new eight-plex in Secaucus, N.J., this past December, a significant first step toward the future of theatrical presentation was taken. For the first time in recent memory, a major circuit had committed itself to employing new technology to greatly enhance, on a regular basis, the projection and sound quality of exhibition and had offered more than just talk. When the doors were opened on the elaborate Secaucus complex, theatregoers found that one of the eight auditoriums was constructed to house the first FuturVision theatre in America. FuturVision is the latest attempt to elevate exhibition to a more vibrant and audience-grabbing height, and it can best be described as a convenient half-step between conventional projection and Showscan. Its dominant features are a floor-to-ceiling, wall-to-wall screen, 70mm film that is projected at 30 frames per second, and a unique digital sound system that employs multiple discrete channels. The results are an image that offers less flicker with more clarity and color brightness, and sound reproduction that could impress even the stuffiest audiophile. In theory FuturVision and Showscan share the same goals, with one major difference. Whereas Showscan (which features 70mm film projected at 60 frames per second) at present requires the permanent redesigning of a theatre's auditorium and projection system, FuturVision can be installed (and removed) by simply adapting a theatre's existing 70mm facilities. While the system does not offer the best possible presentation from a technical standpoint, FuturVision does significantly improve the movie-going experience economically, and that makes it a most attractive compromise for the exhibitor. "We knew that if we were going to have a real chance to improve exhibition, it wasn't going to be by optimizing technology while completely compromising economics to the point that the theatre chains couldn't afford it," says Eric Knutsen, president of FuturCinema Systems. Prior to launching FuturVision, Knutsen spent 15 years with Eastman Kodak as an executive in motion picture production and marketing. "In my estimation, a high quality image and sound system that can be adapted to conventional motion picture equipment is preferable to one that might be the optimum system, but is totally incompatible with existing equipment." Still in its infancy, the route by which FuturVision will make its way into American theatres is still in the planning stages. Loews has an exclusive arrangement with FuturCinema, in which they have first refusal rights to install and operate FuturVision in the over 200 markets where the circuit operates screens (Knutsen anticipates continued support from Tri-Star, which acquired the Loews circuit after the deal was made with FuturCinema). Negotiations are currently underway with other circuits that cover other regions of the country, with the final goal of creating a web of up to 120 FuturVision sites from coast to coast. Announcements of additional chains picking up the system are expected in the very near future, Knutsen reports. While some permanent FuturVision theatres may be built, the more likely situation will be a scenario in which the FuturVision equipment package will travel with a film that has been made exclusively for the process. Consequently, a few requirements must be considered if a theatre is to get the optimum effect. A large auditorium that is more square than rectangular is essential (the new Loews theatre was constructed with this in mind), although seat configuration is not as crucial as it is with Showscan. A large screen is preferable, although a portable screen (generally 50 by 70 feet) can be included with the equipment package. The installation of the screen, like all of the projection modifications, would be handled by FuturVision personnel. From the audio standpoint, the requirements are a little more stringent. The speakers are not included in the package, so a theatre that books FuturVision would be required to have a high quality sound system. Knutsen says that the basic set-up would be a conventional six-channel, 70mm format with left, center and right speakers, a sub-woofer and split surrounds (as many as five speakers should be situated behind the screen, depending on how the sub-woofer is designed). The existing FuturVision package utilizes a double system audio set-up. A separate deck plays the magnetic soundtrack, which is locked in sync with the picture by a control track imprinted on the film (the film would also have a standard Dolby stereo soundtrack for conventional sound reproduction). A single system process with the magnetic track printed right on the film is in the development stages, with both types of audio packages eventually being made available to the exhibitor (the single system will be more convenient, Knutsen says, but the double system allows for more than the six tracks that the single system can hold). The equipment would be leased by the film's distributor and circulated together with the specially-formatted prints (which are adaptable to 35mm for non-FuturVision theatres). The cost would be defrayed by a slight increase in ticket prices, an increase that Knutsen says would be so negligible as to not scare away most moviegoers. "If you look at ticket prices over the past ten years, you'll see that they've almost doubled," Knutsen points out. "And for that doubling, the average moviegoer has gotten significantly less because the screens have become smaller and the auditoriums have become more stark. So, if a small percentage increase in ticket prices were to make a very high impact motion picture experience available to more people, then I think that it has a very good chance of being successful." "FuturVision," he said, "will change the theatre-going experience forever." 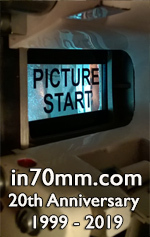 FuturCinema Systems, Inc. celebrates Hollywood's One Hundredth Anniversary. As the creators for FuturVision™ 360, the exciting new big screen high definition motion picture exhibition system with multichannel digital sound, we look forward with great pride to making history together in the coming century. Happy Birthday Hollywood and One Hundred to grow on! New High-Tech Exhibition System Unwrapped In N. Y. New York, June 19 - Fifteen reps of the technical and exhibition camps of the film industry today saw a demonstration at Loews State of a new giant-screen projection and digital sound system in development for existing firstrun theaters (as opposed to the special-venue Imax and Showscan systems). FuturVision 360 was unveiled at a morning gathering of the Intersociety Committee for the Enhancement of Theatrical Presentation, headed by Ken Mason, retired v.p. of Eastman Kodak. Eric V. Knutsen, another ex-Kodak exec, is president of Gotham-based FuturCinema Systems Inc. Targeted for full operation by October, FuturVision process also is being applied to production, using a special lens system and five­perforation 65m camera in development by Panavision. Resulting negative is adaptable to current release print formats, 70m and 35m. According to Knutsen's scenario, major producer-distribs would shoot an adventure film or musical feature with the 65m camera (which boosts conventional speed of 24 frames per second to 30). After deciding which firstrun theaters will showcase the finished product in 70m, distrib would lease the FuturVision equipment for installation at the theaters by FuturCinema personnel. Distrib's extra costs for the bigger bang could be defrayed by an admission surcharge. Process is adaptable to 35m for secondary release. Installation would follow a site survey, ensuring that the theater's proscenium can handle one of the large screens. Knutsen said seating capacity of the theater isn't important, but "the geometry, the aspect ratio between viewer and screen must be assessed." A 44-by-66-foot screen was hung upstairs at Loews State 2 for the demonstration, dwarfing theater's permanent screen. According to the FuturVision exex, Loews Theaters already corralled exclusive franchise to the system in markets where it operates theaters. Knutsen pointed out that the digital audio facet of FuturVision prototype got its first commercial tryout at the 57th Street Playhouse during the recent engagement of Cinecom International's "Home Of The Brave." Ordered by the distrib on "short notice," the eight-channel sound system was a challenge to install, per Knutsen, because the theater's small, narrow projection room and projectionist who has been unschooled in the process. FuturVision requires platter projection systems so a portable one was brought in, he added. The industryites who saw, and applauded, the unspooling of various workprints included Glenn Berggren of Optical Radiation Corp. ORC will develop and supply FuturVision with the projection lens system; Joe Alterman, executive director of the National Association of Theater Owners; Sam Feldman and Joe Kelly, construction veepees for Northeast Theater Management and United Artists Communications Inc., respectively; and John Pytlak, technical exec at Kodak. The intersociety is comprised of reps of NATO, the Motion Picture Association of America, Theater Equipment Association, Association of Cinema & Video Laboratories and the Society of Motion Picture & Television Engineers. FuturVision also is being prepped for demonstrations at the SMPTE and NATO conventions in the Fall. It also was added that the system is compatible with Imax films, while Showscan is considered "a friendly foe."